What does 3D printing look like in your school? The team at MakerBot just sent me their new guidebook for educators and I’m excited to share some highlights with you! The MakerBot Educators Guidebook: The Definitive Guide to 3D Printing in the Classroom was created with the support of MakerBot educators and contains lots of useful information for 3D printing in education. You’ll find 3D printing lesson ideas and resources for schools and teachers. With almost 200 pages, color photographs and step-by-step instructions the MakerBot Educators Guidebookincludes lesson ideas that can be tailored to different levels and connected to a variety of subject areas. If you missed my post from last fall on getting started with a MakerBot printer you can read it here. I talk a bit about my experience setting up the printer and ideas I had for use cases. Well the MakerBot Educators Guidebook for 3D printing is a terrific resource for teachers getting started with 3D printing or those looking to take their work to the next level. The first chapter provides an introduction to 3D printing with an overview of terminology, parts of the MakerBot Replicator, and a few examples of ways that 3D printing are used in different industries. It’s a good place to start if you’re totally brand new to using a 3D printer or are looking to dive in a little deeper. I love the connection to different industries too. 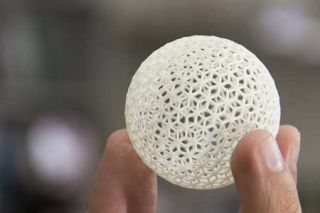 You’ll definitely want to learn more about the use cases they share to communicate the ways 3D printing is used to problem solve around the world. The second chapter of the MakerBot Educators Guidebook includes an overview of 3D printing in the classroom. You’ll find information on the adoption of 3D printing across the country and additional terminology to add to your vocabulary. This chapter includes information on how to prepare files for printing and will help you understand the difference between shells and infill as well as a pre-print and post-print checklist. The third chapter includes an overview of Thingiverse, an awesome resource from MakerBot that I featured last year. Thingiverse Education is an online portal full of 3D printing projects for students and teachers to explore. You’ll also find a step-by-step guide in this chapter for contributing your own project to Thingiverse. Part Two of the MakerBot Educators Guidebook is where you’ll learn about lots of different projects for 3D printing in the classroom. Each lesson in the guidebook has a summary, learning objectives and connections to the NGSS Standards (as well as state and national standards in some cases). The bright, colorful pictures help you navigate the steps to follow and you’ll find teacher tips in this section too. I love the clear connections to learning goals and how these lessons can be used as models for your own unique projects for students. The last section of this book includes ideas for taking your 3D printing work to the next level after printing, along with tips you’ll want to take a look at if you want students to help their final projects shine. As you dive into the MakerBot Educators Guidebook: The Definitive Guide to 3D Printing in the Classroom I’d love to hear what you think! Learn more about this 3D printing guidebook on MakerBot’s education page.